Have you ever heard of the East African spirits, Konyagi and Uganda Waragi? Today, I’d like to tell you a bit about each one and pit them against each other in a taste test. Let’s see who comes out the winner. Not too long ago, I met up for the first time with a reader of this blog who recently relocated to Dar es Salaam from Kampala. Although we had never met before, we found that we had a lot in common including that our parents had completed their graduate studies at the same university in the U.S. (at the same time and even knew each other) and that we shared a common friend. Our first encounter was an interesting one where we shared our life stories and spoke about things we could both relate to, such as the differences and similarities between life in Uganda and Tanzania. This we discussed at length. Our discussion went as far as to include the spirits produced in each country. My new acquaintance and I were both familiar with Uganda Waragi, the Ugandan spirit. She had never tasted Konyagi, Uganda Waragi’s Tanzanian counterpart. She asked me how I thought the two compared. That question was the inspiration for this post. Before I go any further, allow me to ask you first: Have you ever drunk Konyagi or Uganda Waragi? If so, which do you prefer? Please let me know in the poll below. When I think about these two spirits and the role they’ve played in my life, I begin to chuckle. The first time I ever got tipsy (at a cousin’s wedding function where we, the bridesmaids, were trying to pass for older than we really were), I was drinking Konyagi. The first time I ever got drunk (forgive the unladylike admission 😉 ) was the summer before I started university after an evening spent sipping Uganda Waragi and Krest Bitter Lemon at ‘Half London’ in Kampala. Suffice it to say, these drinks and I go way back! Anyhow, in case you are not familiar with either of these spirits, let’s start by taking a look at some facts. 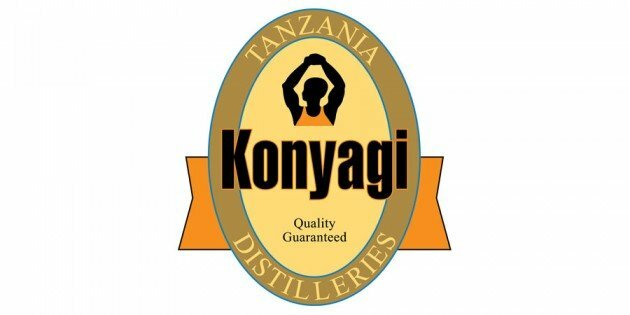 Konyagi, produced by Tanzania Distilleries Limited (a subsidiary of Tanzania Breweries Limited), is a white spirit made from molasses (sugarcane) that has an alcohol content of 35% by volume. 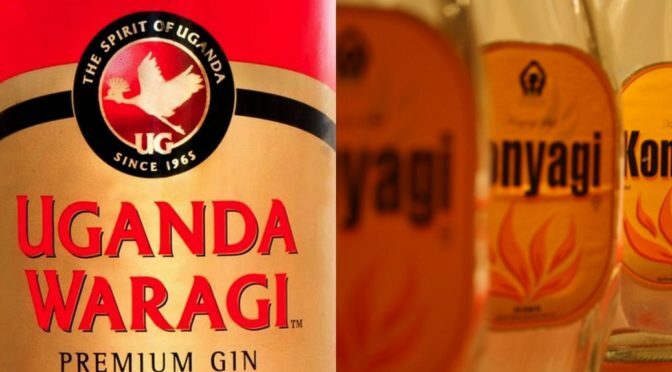 Uganda Waragi, on the other hand, produced by East African Breweries Limited, is a triple distilled white spirit made from millet with an alcohol content of 40% by volume. If I gather correctly, therefore, Konyagi is a rum while Uganda Waragi is a gin. To describe the taste of these two spirits to you, I could rely on memory. For a more objective analysis, I decided to set up a taste test where I could pit these drinks against each other in a more direct way. To do this, I mixed a cocktail of each spirit and tonic water in a two-to-five ratio (with no lime and no ice cubes), put them in two different glasses, conscripted a volunteer taster who would sample these beverages in a blind taste test, and set out to see how these two spirits truly compared. As I laid out the cocktails for the taste test, the first thing that my volunteer taster commented on was that the cocktails looked identical (which was to be expected since Uganda Waragi and Konyagi are both clear spirits). We then began our test by smelling each cocktail. Glass A, in my opinion had a stronger smell than Glass B, but my volunteer taster did not agree. Oh well, we agreed to disagree and proceeded to taste each cocktail. My volunteer taster picked up Glass A and took a sip. What can I say? Uganda Waragi has a very distinctive flavor. After cleansing his palate, he then took a sip from Glass B, the cocktail made with Konyagi. He instantly started to accuse me of having made a mistake in my proportions. He was sure that I had put less tonic water in the Waragi cocktail than I had in the Konyagi cocktail. I had not. The fact is that Uganda Waragi has a higher alcohol content than Konyagi and apparently the volunteer taster could taste this (I had never noticed this before). I then tasted both cocktails. When I tasted the Waragi cocktail, I muttered something under my breath about how wonderful Uganda Waragi is (not kidding!). I then cleansed my palate and tasted the Konyagi cocktail. Involuntarily, I winced. Now, let’s be clear: I drink Konyagi regularly and I don’t normally wince when I do. But, somehow, after the Uganda Waragi, the Konyagi tasted unpleasant. In discussing the two drinks that we had sampled, the volunteer taster and I both concurred that the Konyagi cocktail was sourer (for lack of a better word). Although he didn’t think that this was a bad thing, for me, this is the thing about Konyagi that I do not like and often try to mask by punching it with strongly flavored sodas such as Coke. In my opinion, the word ‘sour’ sort of describes this disturbing quality, though not completely. This quality, to me, is not just about taste, it also has to do with odor. The odor of Konyagi reminds me somewhat of rubbing alcohol. The volunteer taster did not concur. He found the Konyagi cocktail a mellower, less alcoholic beverage and though not as exciting as the Waragi cocktail, he found it pleasant enough. Something that surprised me during the taste test is that, after a short while, the Konyagi cocktail seemed less bubbly than the Uganda Waragi cocktail. The volunteer taster agreed with this observation. I can offer no explanation for why this occurred, but it’s something that I had experienced previously while drinking Konyagi. Konyagi cocktails often seemed flatter to me than expected. I’m glad that this showed up in the taste test so now I know that whatever the cause, it’s not just my mind playing tricks on me. Finally, I pressed my volunteer taster to summarize what he thought of the two drinks that we had just drunk. He said, above all, that he liked both drinks despite their difference. He found the Konyagi cocktail mellow and less strong, while the Waragi cocktail he found a true delight. His exact words were that the Waragi cocktail was “exciting”! Still, he said he would recommend either drink for different moods and situations. I, on the other hand, greatly preferred the Uganda Waragi cocktail. I preferred the flavor as well as the kick! Maybe you’d like to try each of these drinks and make your mind up for yourself, in case you haven’t already. If so, let me share with you some of the ways that you can drink each of these beverages. From the label on the Konyagi bottle, it is recommended that Konyagi be drunk neat with a wedge of lime and ice cubes (if desired). 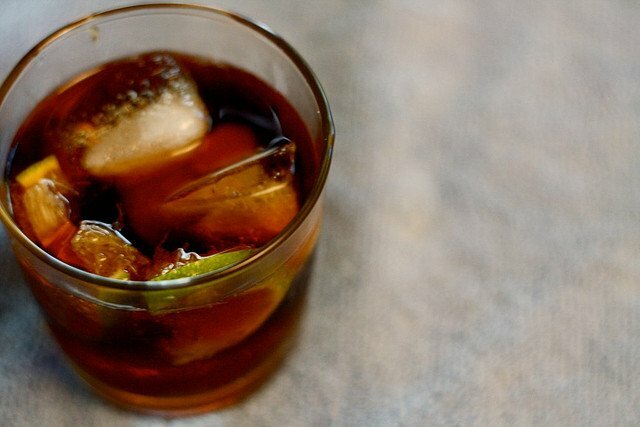 Personally, I like my Konyagi in a traditional Cuba Libre. The producers of Uganda Waragi recommend five ways of drinking their product: on ice, in cola, with lime, with ginger ale, or with tonic. Many of the Ugandans I know like to mix Uganda Waragi with Krest Bitter Lemon, which is a very tasty combination. Personally, my current preferred way of drinking Uganda Waragi is with apple juice—not just any apple juice, however, but perfectly chilled Apple Splash. It’s a little strange I know, but I love it! And now I think I’ve said enough. It’s time to hear from you. If you’ve ever had either of these spirits, what is your preferred way of drinking Konyagi and/or Uganda Waragi? If you’ve had both, which of these spirits do you prefer? P.S. Did you enjoy this post? If so, subscribe to ChickAboutTown today and be sure to get new posts as soon as I publish them. You can also follow me on Twitter or on Facebook for daily musings on living & lifestyle in East Africa. Signing up is free and easy! Waragi. any day. Nice write-up btw! Waragi all the way. I find that it doesn’t have a hangover, smooth in taste(doesn’t burn. Great post, now i miss .ug. Prefer waragi too, without anything in it to fully enjoy its taste! Waragi straight? Wow! Strong. I don’t think I’ve ever had that. I’ll have to try it out sometime. The drink you describe to me sort of sounds like a Dawa, though I’ve never had a Dawa made quite the way you describe it. I guess it can be made with Waragi, sour oranges, and sugar cane. konyagi nytym bt wudnt mind warag.hav tried both enough times. Bt i prefer konyagi. Nice post tho! Keep it up! Maybe the best way is the Iringa village way — a generous shot of Konyagi to enhance a big mug of bamboo wine. Great party fare at the right season. Welcome to ChickAboutTown! Thanks for that recommendation. I’ve never had bamboo wine. What does that taste like? UG no doubt!!! Can match any gin in the world…. Welcome to Chick About Town! I like that: “dawa ya kuongea lugha miya”. Hahahahah…. On my side, I haven’t tested the Ugandan Walagi but for Konyagi… Its my favourite drink. As they say about it.. It’s not a vodka , It’s not a gin , It’s Konyagi . Yes, it’s definitely Konyagi as it taste fantastic in all mix. I like it with Lemon and Red Bull. I have tested it with various flavours including Ginger Ale, Tonic Water, Stone Tangawizi and Coke too. Thanks for more details on Walagi.. I will order it for a taste. Thanks again for the comment. So you are a Konyagi lover? 🙂 I will have to try your combination of Konyagi with lemon and Red Bull. I’ve never had it that way before. You may also try it with Stone Tangawizi.. it has a nice flavour too.. Just mix 4 pegs of Konyagi, 2 Slice of Lemons, ice Cubes and then add stone tangawizi. Trust me its flavour is awesome too. You didnt give feedback on Konyagi and Stone Tangawizi. or still haven’t tasted it yet? Just passing on this post and i have an idea for a blog post on Konyagi.. Hope you will get to read it on my blog.